Our great pleasure to have SAPPI to have sharing and special workshops for our students. we learnt so much from them! we are thankful for the inspiring sharing and greatly appreciated their time with us. SAPPI, a joint venture between Malaysian studio Silver Ant (SA) and Japanese studio Polygon Pictures Incorporated (PPI). Since its launch in 2013, SAPPI has completed a wide range of high-profile projects, mainly from Japan and the USA, including such titles as Transformers: Prime, Transformers: Robots in Disguise, Knights of Sidonia, AJIN, Lost in Oz: Extended Adventure, and more. SAPPI artists are currently very excited to be working on Pingu in the City, Star Wars Resistance and other distinguished projects. 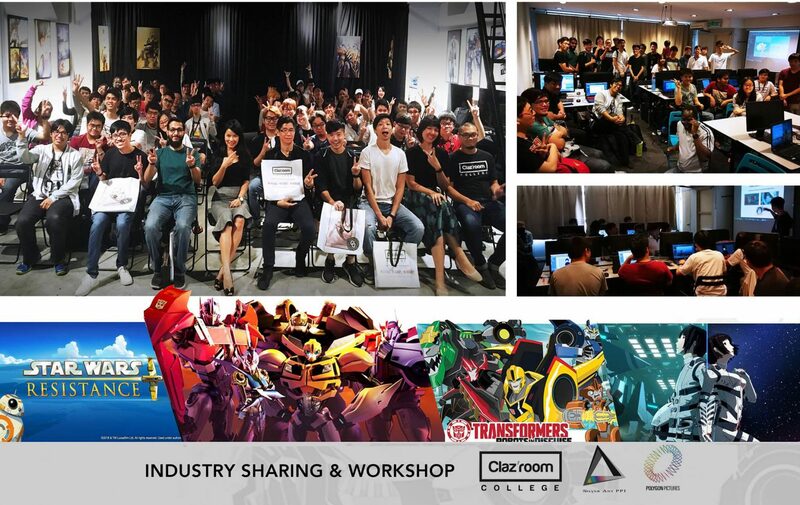 The workshop lead conducted by Warner, Animation & Lighting and Compositing Department Manager, assisted by Aayush, Lighting & Compositing Group Leader, Jerry, Animation Group Leader, YewChin, Animation Supervisor was so informative and well received by students. Students were truly inspired, and we wish to see more of our graduates joining SAPPI for the exciting projects SAPPI brought in Malaysia. Group Photo of Clazroom students and SAPPI’s COO Mr.Yoichi Ataka and his staffs that leads the workshop.